The LED Dazzler is a very complex, yet simple design used to control a HL1606 based LED ribbon which contains a microcontroller. Original design and software is based on an article by John Cohn posted as an Instructable. Using a minimal amount of components, the LED Dazzler is able to control LED ribbons, at 5 volts of any size up to and beyond lengths of 5m (16+ feet) or more, producing a full halo of colors in stunning display patterns and sequences. The processor used on the LED Dazzler is a PICAXE 08-M 8-pin microcontroller which has the preprogrammed code stored in it which contains not only the lighting sequences, but also the base code necessary to control the LED ribbon. The processor is reprogrammable with your own sequences providing you have an inexpensive programmer setup capable of programming the PICAXE 08-M.
Want to see the LED Dazzler in action? Posted on YouTube is a video of the controller running to some of our Digitally Addresable LED Ribbon. Assembly time of this project was about one hour and the results are amazing to see. The LED Dazzler is available as a fully assembled and tested product, as a kit of components you can build at home, or just the bare board which you can supply your own components for. Average assembly time of the kit can be accomplished by the novice builder in about 15 minutes. The LED Dazzler processor is a based on the PICAXE 8-pin processor. Original code was designed for the PICAXE-08, which has been updated to the PICAXE-08M2. The new 08M2 processor has many new features, including expanding the RAM from 256 to 2048 bytes. This expansion in storage space can allow for much larger and fancier display sequences. At this time, we do not have any sequences for that utilize the extra RAM capabilities, but we have released a small update to the original code which is customized for the 08M2 processor. We are always looking for user contributed code, so if you have a customized sequence you would like to share with others, we would be happy to post it here. The LED Rainbow is a high quality, double-sided board, complete with solder masks on both sides, plated holes along with a high-contrast silk-screen labeling component positions. 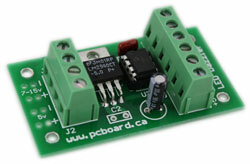 The board is a compact 2.5" x 1.4" (64mm x 36mm) ready to fit into standard size project cases.